At Enhance® Medical Center, Charles S. Lee, MD and our team see quite a few patients focused on improving the appearance of an aged, lax neck. Could the rise in neck-related inquiries be linked to “Tech Neck” – i.e., the physical effects of constantly looking down at a smartphone? Or is our propensity for selfies simply heightening our awareness of our physical flaws? No matter what cause of the imperfection or the motivation for a more attractive neck, Dr. Lee and our team can help with a wide array of solutions. If you have minimal to moderate neck laxity and want noticeable results without the recovery or expense of surgery, you may be an excellent candidate for a non-surgical, energy-based treatment. One option is Ultherapy, an FDA-approved treatment for moderately lax or “crepey” skin on the face and neck. 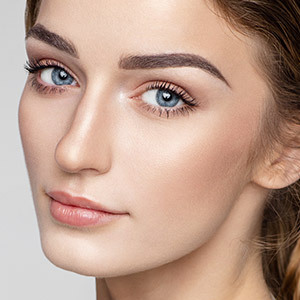 With no injections or incisions, the non-surgical procedure delivers ultrasound energy to heat the tissues, triggering the production of fresh collagen. Over time, the resurgence of collagen naturally lifts, tightens, and rejuvenates the skin of the face and neck. Another great non-surgical solution to neck laxity and sagging is ThermiTight. Like Ultherapy, ThermiTight is an energy-based treatment. But one of the unique advantages of ThermiTight is that it works from the inside out; in other words, it delivers radiofrequency energy through the underside of the skin. This allows our team to heat the neck tissues to a temperature that melts fat and induces the production of collagen, without burning or injuring the surface of the skin. Sometimes the problem isn’t skin laxity but rather excess fat that interferes with an elegant neck contour. In those cases, Kybella is a safe and effective non-surgical solution. The cosmetic injectable dissolves unwanted fat under the chin to create more definition between the neck and chin. If you have significant laxity and noticeable muscle banding in your neck, you probably will not see great results with a non-surgical treatment. You are most likely better suited to neck lift. During the procedure, Dr. Lee lifts and tightens the skin and muscles on the neck for a more youthful contour. Neck lift can be performed as a standalone procedure but is often folded into facelift to address age-related issues in the middle and lower face. Facelift with neck lift can help to correct jowling and lack of definition along the jawline. The treatment option that is right for you will depend on your anatomy as well as your expectations and goals. Dr. Lee invites you to meet with him to discuss what bothers you about your neck and what you hope to achieve from treatment. To schedule an appointment with Dr. Lee, please call (310) 271-5954 or email Enhance® Medical Center today.